Meh. Full transparency would be best, but I find it hard to believe Barr would have distorted or “shaded” Mueller’s findings in his summary knowing the enormous risk that to his and the DOJ’s reputations if the truth leaked. Mueller knows what the report says. So do Mueller’s deputies. So does Rod Rosenstein. So do any other higher-ups at the Department who consulted on the summary. If Barr’s being cute about what the report describes, all it would take is one person whispering to the media about it and he’d be at risk of impeachment. But yes, let’s have the full report. It’s not a proper political controversy in America 2019 unless there’s a document from which both sides can cherry-pick quotes to confirm their biases. In light of Barr’s findings, it’ll be the left this time that does most of the pickin’. Attorney General Barrs letter raises as many questions as it answers. The fact that Special Counsel Muellers report does not exonerate the president on a charge as serious as obstruction of justice demonstrates how urgent it is that the full report and underlying documentation be made public without any further delay. Given Mr. Barrs public record of bias against the Special Counsels inquiry, he is not a neutral observer and is not in a position to make objective determinations about the report. And most obviously, for the president to say he is completely exonerated directly contradicts the words of Mr. Mueller and is not to be taken with any degree of credibility. When prosecutors say that an investigation did not establish something, that doesnt mean that they concluded it didnt happen, or even that they dont believe it happened. It means that the investigation didnt produce enough information to prove that it happened. Without seeing Muellers full report, we dont know whether this is a firm conclusion about lack of coordination or a frank admission of insufficient evidence. The difference is meaningful, both as a matter of history and because it might determine how much further Democrats in Congress are willing to push committee investigations of the matter. Did Mueller get 95 percent of the way towards finding probable cause that Trump conspired with Russia or did he get zero percent? Barr didn’t elaborate but the Democratic House is obviously keen to know, and it’s impossible to rebut White’s point without the report in hand. I’m skeptical that Mueller was a near-miss on accusing Trump, though, given the fact that no one else in the campaign was indicted for conspiracy either. Logically, in a near-miss criminal case against the head of an organization, you’d expect some deputy to cross the line of probable cause; then it’s a matter of proving that he acted with the knowledge, or at the behest, of the boss. How likely is it that not just Trump but everyone in his orbit were near-misses to believe they conspired with Moscow? Not very, I suspect. Crucially, we dont know whether Barr concluded that the president didnt obstruct justice or that he couldnt obstruct justice. Well before his appointment, Barr wrote an unsolicited memo to Rosenstein arguing that Muellers investigation was fatally misconceived, to the extent that it was premised on Trump firing former FBI Director James Comey or trying to persuade Comey to drop the investigation of Michael Flynn, Trumps first national security adviser. Barrs memo was a forceful exposition of the legal argument that the president cannot obstruct justice by exercising certain core powers such as hiring or firing staff or directing the course of executive-branch investigations. So although Barrs letter to Congress says that he and Rosenstein found no actions that constituted obstructive conduct undertaken with the requisite corrupt intent, we dont know whether he means that Trump didnt try to interfere with an investigation, or that even if he did, it wasnt obstruction for a president to do so. Democrats in Congress will want to probe that distinctionas they should. That’s the “bias” to which Pelosi and Schumer referred in their statement. Before becoming AG, Barr was a strong skeptic of the idea that a president could obstruct justice by exercising powers he lawfully enjoys under Article II, even if it involves a matter in which he’s implicated and especially when there’s no proof that he committed an underlying crime. Obstruction typically requires “corrupt intent;” how could Trump have had corrupt intent to obstruct, Barr might have reasoned, if there was no underlying crime that he was trying to cover up by obstructing the investigation? Other prosecutors have noted, though, that the feds certainly do charge people with obstruction sometimes even when they’re not guilty of an underlying crime. White’s point is that, without knowing what the report says, we’re left to wonder if Barr concluded that there was no obstruction here not because the evidence wasn’t strong enough but because of his own somewhat novel theory that the president should be immune from such a charge under these circumstances. The fact that Barr made a point of noting Rod Rosenstein’s input in his conclusions about obstruction, though, makes me think he’s aware of this critique and was signaling that those conclusions were reached on the merits of the evidence, not some broad legal theory that the president can’t obstruct. Rosenstein, after all, explicitly or tacitly approved an obstruction inquiry into Trump’s behavior. He appointed Mueller to the role of special counsel in the first place to investigate Trump. Anti-Trumpers have pointed in the past to Rosenstein’s “protection” of Mueller’s investigation as reason to believe that findings on obstruction would be presented fairly. Rosenstein has no reason to play nice with Barr either, as he’s been planning for months to leave the DOJ after Mueller’s probe ends. How likely is it that, after installing Mueller in the role and defending his independence for two years, Rosenstein would now rubber-stamp a theory that there couldn’t have been obstruction as a matter of law? 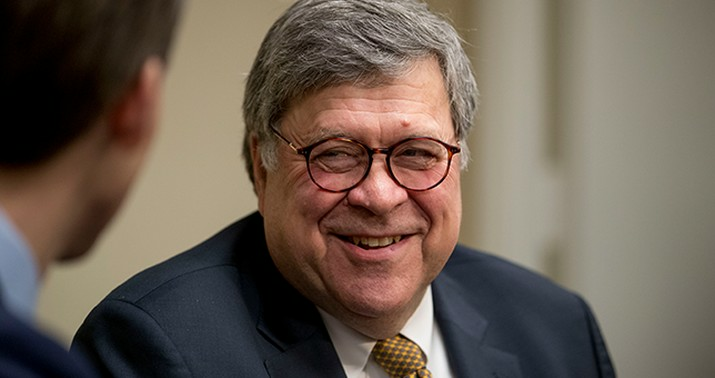 One other point made by White, Renato Mariotti, and others is that Barr made his conclusions verrrry hastily, cranking out a summary within 48 hours after receiving the results of a two-year investigation. Why not take his time before issuing a verdict on obstruction? I take that point, but if Barr had sat on the report for days while mulling the obstruction findings the claim from other critics would have been that he was using the time to concoct some elaborately contrived spin in Trumps defense. “Barr’s quiet on the report because he’s busy figuring out how to lie about it!” He was damned if he rushed something out and damned if he took his time. He seems to have chosen to rush, probably as a gesture to transparency. I have no answer to this point, though, which I’ll leave you with. How can Barr have made the call on obstruction in this case if the whole point of having a special counsel is to insulate charging decisions from political appointees? Odd that (1) #Mueller would reach no conclusion on obstruction and (2) AG would decide the issue for him. This defeats the whole purpose of a special counsel, which is to avoid conflicts of interest by those in the executive branch chain of command. Let’s take a poll of the American people to see who they trust more...AG Barr, or Chuckie and Nazi. Yes, I would like a full and unredacted Mueller Report. I say keep it locked up in the A/G’s office. Screw Pelosi, the media and the haters. They won’t believe the facts anyway. They don’t deserve to see this report. How did they feel about Holder and Lynch covering Obamaxand Hillary crimes? Those polls are called elections, and they are always uncomfortably close. A large percentage of American voters (legal and illegal) are not clear thinkers. Either they are deluded by special interest pandering (race, LGBT, gibsmedat), or they are a bit soft mentally and subject to the billions of dollars spent in media manipulation. Would the moronic dems get their stupid story straight? It’s either racist or a big lie. It can’t be both. The Mule and Co. corrected a Buzzfeed story that was wrong. Do they think that they would not eaisly say that what the AG said was false too? No. Release it all. Including the unredacted FISA applications, the hush money paid with our tax payer dollars on behalf of criminals in Congress, and the grand jury indictments of Hillary and her clients. FLOOD the system with it all and let them try not to cover it as the Feds go to arrest them. Nah, no restoration, just as it is. Couple boxes of WWII C rations, water, and lice-ridden blankets. Wonder how soon pelousi and stupider begin construction of the camps ?? I guess I’ll have to take a look in the dictionary to see if Chuckie’s pic is next to the word. I thought it was a synonym for Sheisse. We cannot trust Pelosi and Schumer considering their bias against President Trump among a million other things. How can Barr have made the call on obstruction in this case if the whole point of having a special counsel is to insulate charging decisions from political appointees? As Alan Dershowitz, law professor, pointed out, Barr made the call because Mueller did not do his job which was to have made the call himself. Mueller either did not do a complete job or he did a political maneuver by leaving the decision up to Barr (and the large number of DoJ people Barr has alluded to as giving opinions)and so clearly as Mueller knows what he is doing as a prosecutor and did a thorough job otherwise he left the obstruction part open to continue the political battle. Clear as day. What is the point in blathering on about this except to muddy the water again? No wonder it is called a swamp. They could always call Muller and ask him if the summary is fair and accurate. The “investigation” was begun and sanctioned by an (acting) attorney general, and is part of an ‘ongoing investigation’ by the office of Attorney General. It’s NOT a public, or congressional, investigation and the public, nor Congress has no claim to it, or any business in seeing it. If the AG wants to release it, so be it; but pelosi, nadler,schumer, shiff, waters, the media, et all, just need to shut up and accept the results at face value, like they assumed we should accept their accusations of “collusion” at face value.